For the crunch World Cup match against England last year, Uruguay were without their captain and centre-back Diego Lugano. In to replace him came Jose Maria Gimenez, a 19-year-old who had played in a grand total of one league match the previous season and one Copa del Rey fixture for Atletico Madrid. It is hard to imagine England, or another major European nation, throwing a youngster into the deep end in this way. But Uruguay had no qualms. Gimenez had been immaculate the previous year in the World Under-20 Cup, and that was good enough. This story helps to explain the importance of under-20 football in South America. There are plenty of others like it. In 2003, for example, Javier Mascherano was given his Argentina debut before he had made a club appearance for River Plate. His performances at under-20 level had shown that he was ready. The South American nations have grown used to the reality that their best players will move abroad early. The youth sides, under-17 and under-20 are where they are captured for the long-term future of the senior national team. Those who do well in the South American Under-20 Championships can expect to be fast tracked into the senior squad. 2005, held in Colombia: This is where a little 17-year-old called Lionel Messi first came to wider attention. Alongside him were Pablo Zabaleta and three other players who went to last year's World Cup.Five of Colombia's 2014 World Cup squad were also on show, as well as Radamel Falcao, who had to take a back seat to Hugo Rodallega, the tournament's top scorer. 2007, held in Paraguay: Alexis Sanchez of Chile was the star turn, while Argentina groomed World Cup keeper Sergio Romero and Angel Di Maria provided bursts of inspiration.Brazil had Lucas Leiva and Fernando, who picked up a long suspension for attacking a referee. The best players of the tournament included Edinson Cavani and Martin Caceres of Uruguay. 2009, held in Venezuela: The outstanding player was Nicolas Lodeiro of Uruguay, who has still not lived up to his early promise. Sandro had a fine tournament for Brazil and Jefferson Montero had some good moments for Ecuador, though his Swansea team-mate Federico Fernandez did not have a happy time with Argentina. 2011, held in Peru: The Brazil forward line of Neymar, Lucas Moura and Oscar were by far the best thing on show, in a team which also included full-backs Danilo and Alex Sandro. 2013, held in Argentina: Colombia playmaker Juan Fernando Quintero was head and shoulders above anything else in the competition - and some 18 months later was scoring in the World Cup. It was a gruelling month in Uruguay, with the teams playing nine games in 25 days, finishing on Saturday. The extended format features two groups of five, with the top three from each group going into what is clumsily entitled the hexagonal final, where they all play against each other. Four places were up for grabs in this year's World Under-20 Cup, taking place in New Zealand this June. One-and-a-half places were also at stake in next year's Rio Olympics. As hosts, Brazil qualify automatically, which is just as well, because otherwise their desperately disappointing side would have missed out. Brazil finished fourth, and will face Olympic competition from old rivals Argentina, who won the competition and thus made sure of the automatic place with a 2-1 win over Uruguay in the final game - a result that left Colombia in second place, going into an Olympic play-off with rivals from Concacaf. It was heartbreak for Uruguay, Olympic gold medallists in 1924 and 1928, who will miss out on Rio. But at least they, along with Argentina, Colombia and Brazil, will be representing South America in New Zealand later this year. 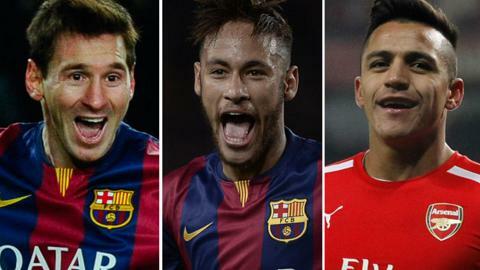 But who impressed the most - and could they be gracing Europe's top leagues in the coming years? Many of the headlines went to nine-goal Giovanni Simeone, son of the Atletico Madrid boss Diego. Simeone Junior is a thoroughly competent finisher, but the reason he had so many chances was in large part because of Angel Correa, the tournament's outstanding player. With the dribbling skills of a winger, the penalty area nous of a centre forward and the passing range of a central midfielder, Correa undressed opposing defences time and again in a tournament that marked his triumphant return to the game. In the middle of last year the San Lorenzo support striker was signed by Atletico Madrid. But the routine medical revealed a career-threatening heart problem. He underwent an operation and, eight months later, used the South American Under-20 Championships to remind the world that he remains one of the most dazzling promises in the game. One of the rare bright lights in a disappointing Brazil team, left-footed Gerson was filling the notebooks of European scouts and winning comparisons with Paul Pogba of Juventus. It is still very early. Just 17, Gerson will be available for the next version of this tournament in two years' time, and has yet to make his first-team debut with Fluminense. Not surprisingly for one so young, he had an inconsistent time and did not always appear to be fully trusted by his coach. But there were flashes of unmistakable talent to go with his developing physical strength - an inspired through ball here, a dip of the shoulder there, were sufficient to raise hopes that Brazil might have an all-round midfielder of considerable quality. With an excellent goalkeeper (Alvaro Montero), an efficient defensive unit and some interesting midfield play, Colombia had a claim to be the best team on show in the tournament. Centre forward was not their strength, but they did reveal a fine attacking prospect in winger Jeison Lucumi. Naturally right-footed, Lucumi began the tournament on that flank. By the end, though, he was featuring more on the left, and the four goals he scored were equally divided between both feet. Long striding, he is a fluent and elusive runner with the ball who, as well as scoring, set up a stream of chances with his bursts to the byeline. Lucumi is currently with America of Cali, a giant of Colombian football who have fallen into hard times and are currently in the second division. He is surely unlikely to stay there for long, with his agent revealing that soundings have been coming in from clubs all across Europe and Latin America. Unusually for an under-20 competition, this year's tournament threw up a fine crop of goalkeepers, and Colombia's Montero was probably the best of the bunch. A giant, imposing figure who spread calm through the defence and also showed excellent reflexes, Montero was beaten just three times in the eight matches he played. Colombia did well to find him. He has never played professionally at home, and has spent the last couple of years in Brazil with Sao Caetano, currently in the fourth division. But on the form shown in Uruguay, within a few years it is possible to imagine Montero challenging Arsenal's David Ospina for a place in the senior national side. The lanky attacking midfielder is already an established star with Montevideo giants Nacional, and was even compared to a left-footed Socrates as he helped the club cruise to the last domestic title. So the pressure was on him to deliver in front of his own fans, a task not eased by the fact that Uruguay's direct style frequently bypassed midfield. He was equal to the challenge. His five goals made him the competition's second top scorer, and also highlighted the range of his talent. Two were headers, two stroked home left-footed after skilfully making space and the other was a poacher's tap-in. His surging runs and quick thinking combination passes were among the highlights of the tournament. A number of Uruguay's players are likely to be fast tracked - most notably keeper Gaston Guruceaga and the central midfield duo of Nahitan Nandez and Mauro Arambarri. Pereiro, though, is the jewel. He will be straight into Copa Libertadores action this week when Nacional, 1-0 down from the first leg, are at home to Palestino of Chile. Whatever happens, this is likely to be his last Libertadores campaign for a while. Europe beckons. Son of Atletico Madrid coach and Argentina national team legend Diego, Simeone Junior is a centre forward who at one point threatened Hugo Rodallega's Under-20 goal record (11 in 2005). Having a penalty saved in the penultimate game against Paraguay did not help and Simeone had to settle for nine - but the River Plate youngster gave a masterclass in making finishing look easy, moving well across the attacking line and drilling in his chances off either foot, with no fuss and maximum efficiency. Question marks remain, though. This was a tournament where it was relatively easy for him to build up confidence. Argentina were in by far the easiest of the two groups, and he could capitalise on the fine approach play of Correa, Tomas Martinez and Cristian Espinoza. There were, then, plenty of chances for an eager young centre forward. Time will tell if, at the highest level, Giovanni Simeone is more than a rabbit killer.